The Professional "anatomically designed" full & 3/4 length orthoses are designed to enhance motion control and alignment to aid in reducing and minimizing the incidence of knee and lower back pain. The Professional "anatomically designed" full & 3/4 length orthoses are designed to enhance motion control and alignment to aid in reducing and minimizing the incidence of knee and lower back pain. This is a size specific orthoses program ranging from women's 6 to men's 14, and is the only pre-engineered complete mold program available.The Professional mold series was developed as a size specific program (11 individual molds). 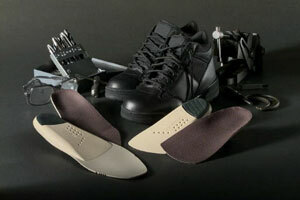 The Professional is designed to cradle the heel and support the arch. The full length series uses Poron, a superior cellular sheet urethane known for its superior shock dampening qualities.The Professional 3/4 is designed to fit a broad range of footwear without compromising fit or function. The professional orthoses are covered with etc., a fabric designed to reduce shear force and friction as well as control moisture inside the shoe. Suitability - General purpose and fitting polyurethane orthoses which will not need accommodation for additional space in the shoe or sneaker. This rear foot motion control orthoses will match the shape and structure of the foot due to it's unique size specific qualities and proportioned support. The full length version has a top cover that extends over the 3/4 orthoses design to provide the same characteristics for motion control and shock absorption for sneakers, dress shoe or work boots. Additional Considerations -These orthoses have demonstrated relieve for discomfort at the feet, knees and back in the occupational settings typically with hard work surfaces, with indications for heel spur conditions, chondromalacia, low back pain, Achilles tendonitis, sciatica, patello-femoral syndromes, calcaneal apophysitis, iliotibial band discomfort, heel pain, supinated or pronated concerns, and for those with an intolerance for rigid orthotics. Atlantic Footcare, 761 Great Road, N. Smithfield, RI 02896. Tel: 401-765-8600; Fax: 401-766-5327.